We are so excited that Sonesta Philadelphia is hosting a citywide art exhibition! International artists have descended on the city to work with the Philadelphia Mural Arts Program. They are creating public art that will "explore and illuminate the city's diverse urban identity." 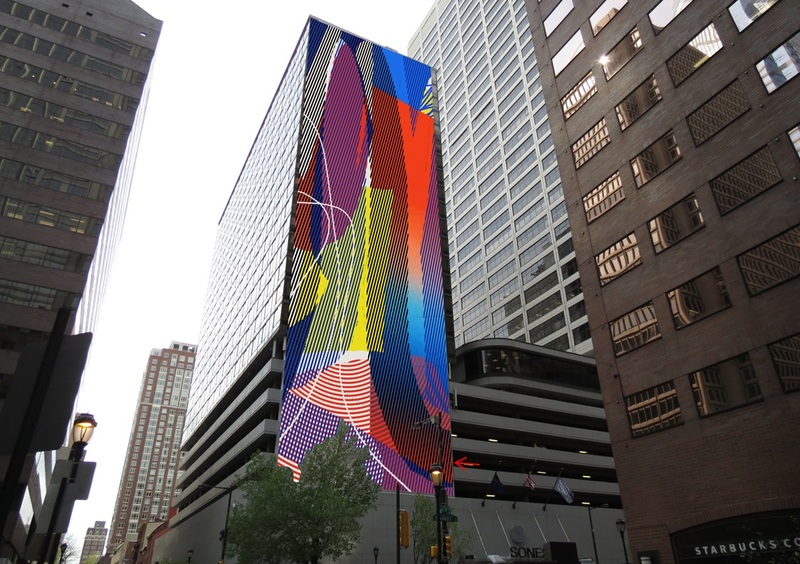 MOMO, an artist from New Orleans, is creating a mural on the 25-story building! When we began designing this hotel, we created something that was fashion forward, high contrast and full of exciting details enhanced by lighting: dramatic, bold, memorable, interactive and sleek. The Urban Modern boutique hotel lobby is in itself a sculptural piece of art... a "jewel box" with street level appeal as well as a dramatic stage set on the inside. It features a revolving art collection and is very interactive for the guest. It is so awesome to see this hotel turn into such a vibrant part of the Philadelphia art scene!